Twitter Cards is a newly introduced meta name system for webmasters and authors, a new head tag to increase your headache and this guide will act as painkiller. As you can understand, Google has added and researching so much and getting attention for schema.org things, Facebook uses Open Graph Protocol to verify, so it is a prestige issue for Twitter. If they can not increase a bit headache to the site owners, then what is ‘social value’ ? Ultimately we have to use Twitter Cards, either you love or hate the pain, simply because it will probably add some extra on SERP as well. After introduction of Twitter Cards, Twitter API is frequently shutting down (you can search with widget tweet loading problem) probably due to TwitterBot is running on the same server. Twitter is well known for such API downtime. That Documentation can make any WordPress user confused, so we adapted the simplified idea by Joost (http://yoast.com/twitter-cards/) and made it more simple. The testing when we are writing, does not worked. We tested with Joost’s website and our 7 domains. But the method is solid, it will work (logically) later. There are few instances of situations, use which is easiest for you. Obviously, twitter:site will be equal to twitter:creator if there is only one Twitter account. The existing Open Graph Protocol for Facebook will work fine for the rest. Those who do not have Open Graph Protocol for Facebook on their head div, can use WordPress Facebook Open Graph protocol plugin (WPFBOGP v2.0.7) from WordPress repo or use social plugins like socialize. Among 7 websites (we use Genesis Custom Designed Theme for all), Socialize failed to insert Facebook Open Graph protocol only for this site. This is difficult to tell why, but probably due to complex interactions for using many plugins for only adding numerous kinds of meta. Thats why we used WordPress Facebook Open Graph protocol plugin. It can be added from Genesis Child Theme’s functions.php file too. Everyone knows how to add a meta like Google verification tag, there is really no meaning to repeat it in detail. This methods will do dual purpose of adding FB plus Twitter things. If you love to have only Twitter Cards as a separate plugin, then use Twitter Cards Plugin from WordPress. We hope that Pinterest, StumbleUpon, Digg, Delicious will not ‘discover’ separate tags. Following schema.org would have been the best for all, just a simple one meta could do the purpose. But as we said – it is a prestige issue – your all neighbors are buying Luxury Sedan, at least you should paint your house. By the apply using that form on Twitter on the above mentioned URL. We can not give any warranty, because it is not Google that has excellent crawlers. This Article Has Been Shared 5036 Times! 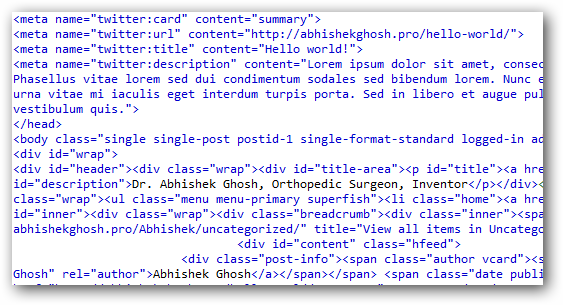 Cite this article as: Abhishek Ghosh, "Twitter Cards : Various Ways to Add in WordPress Meta Data," in The Customize Windows, October 27, 2012, April 21, 2019, https://thecustomizewindows.com/2012/10/twitter-cards-various-ways-to-add-in-wordpress-meta-data/.